Saying goodnight to Rhonda Lee will not have been the easiest thing Nicole Atkins has ever had to do. The American singer did it anyway and must be very proud of the resulting LP. Brilliant things don’t tend to come easy to start with. Sure, I’ve been raving about a lot of records lately, because there’ve been a lot of great songs coming our way. But I highly doubt my girlfriend Rachel will be able to name many other albums that I couldn’t shut up about than Atkins’ Goodnight Rhonda Lee. It’s just incredible, really. 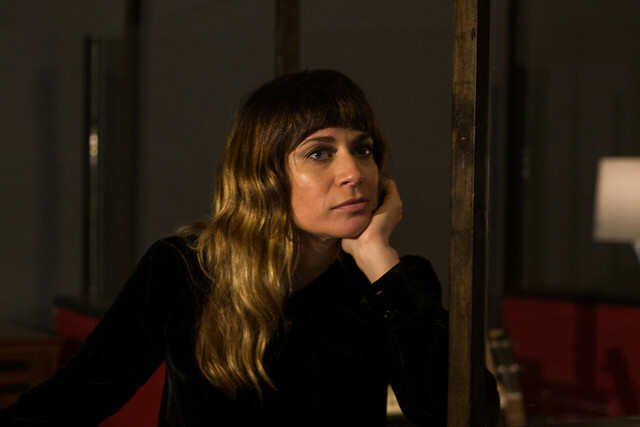 What’s just as incredible, is Nicole Atkins’ determination to not cancel this session. She was touring Europe with her guitarist Steven Cooper and a fractured shoulder. I saw her perform at the Q-Factory in Amsterdam the night before and as amazed as I was by their performance, I couldn’t imagine someone voluntarily picking up a guitar and having a camera pointed at them while being in so much pain. Atkins did though, and after taking a couple of breaths she performed one of the most stunning sessions I’ve had the pleasure of filming. I remember looking at my friend Everaldo – the promoter of said venue – standing in the back of the room with his jaw practically dropped to the floor as Atkins covered Roy Orbison. Nicole Atkins’ voice – as plenty of people have written before me – is a thing of wonders. So much power and soul. Words sung with so much feeling. But it’s too easy to focus on just that. Especially since she’s proven to be a gifted songwriter and such a powerful performer too. Go ahead, listen to the record, I dare you to find a bad song on it. Personal favourites are opener A Little Crazy, Listen Up and A Dream Without Pain. All very well written and moving as can be. Or, or, or… I almost forgot Darkness Falls So Quiet. Listen to that! Or watch the next video from her session first, because it’s a great Can cover. I find it incredible whenever people manage to turn personal experiences and especially hard times into something beautiful. A transcending work of art that can move and comfort complete strangers, no matter where or who they are. Because it’s not that easy, trust me. I myself was very moved when Atkins played her own A Dream Without Pain in this session. There she was, singing a song she wrote about something so personal to her, that spoke to me so strongly. I couldn’t find the words to tell her how much it meant, and to be honest I still can’t, so I’ll just shut up and go have a cold drink outside. There’s a heatwave going on right now in Utrecht. Imagine that. Audio mixed by Ryan Joseph Burns.